A community of select partner companies that provide services and solutions to enhance, extend and complement the capabilities of StoneEagle’s innovative suite of product offerings. Our trusted partners help contribute to the ongoing success of mutual customers in the retail automotive industry. 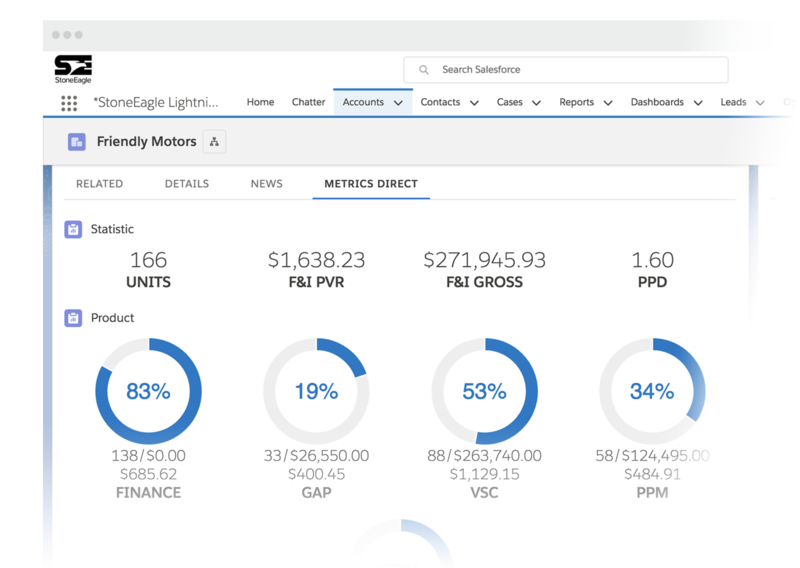 - Luis Gracia, Avid Insurance Services Inc.
SEcureMetrics is easy to use and delivers comprehensive Finance and Insurance reporting that allows our team to make quick income development decisions with our dealer partners. Our dealers have become so accustomed to the quality and accuracy of the reporting provided by StoneEagle that some run their multi-store groups from the reports, while others use the information to pay their people. We truly appreciate our partnership with StoneEagle and their commitment to providing excellent support. Chicago Office: (630) 925-4850 200 W. 22nd Street, #271 Lombard, IL 60148 © 2019 :: StoneEagle F&I, Inc.